It’s five in the afternoon when the school bus taking kids back to their homes usually leaves, which means it’s homework time for ninth grader Līga in the Sala Elementary boarding school. Often, she disregarded the order established in school and went to her favourite teacher Kristīne. Attending to younger boys and girls, they both engaged in what the girl liked doing most – creating fragile origami figures from paper, ornamenting objects, or making candy flower arrangements. ‘You could always talk to teachers,’ Līga says. And to have a shoulder to cry on when necessary, her mother is quick to add. In the small rural school, teachers often played a parental role for Līga and her class-mates. Līga started attending the Sala school five years ago. Her mother, having found herself alone with five children to raise, unemployed, penniless and adequate housing, took Līga and her older sister Lāsma out of the elementary school in the closest city, Preiļi, and relocated them to Sala. The first-grader Beāte and three-year-old Matīss started to take the bus to school 18 km from home with their older sisters. Their mother was left with her youngest child Raivis, then, only few months old. This is where our little Matīss grew up in fact – in a boarding school from his very first days,’ the lean woman says about her boy, a child with sharp, twinkly eyes and close-cropped hair who is now in the second grade. Somewhat insecure, Iveta keeps adjusting her hair. Her thin lips are pressed tightly together in her tired face; her eyes turn to you open and glowing with warmth. 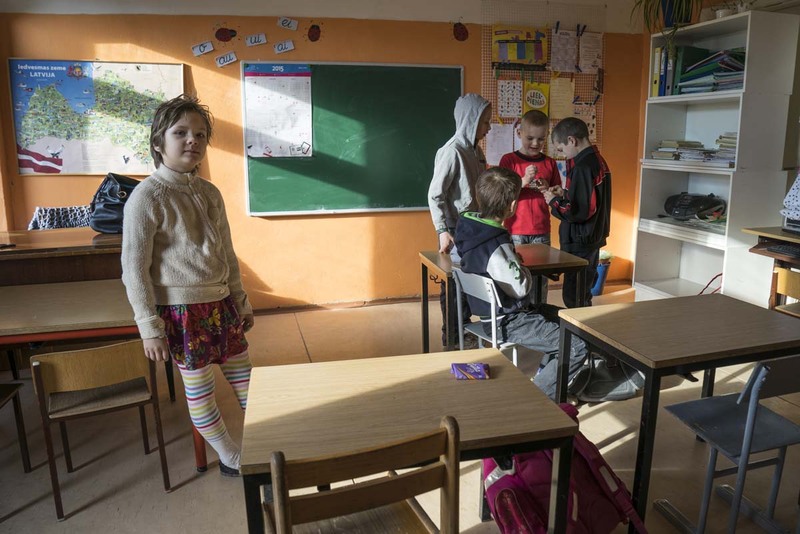 Rural schools in Latvia often serve as a refuge for the socially vulnerable. They play a special role in providing this kind of help, something often missing in the larger ones. 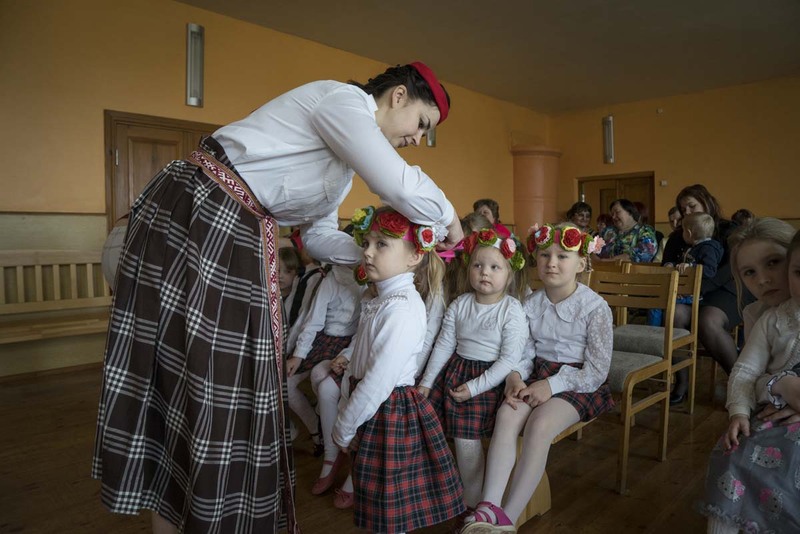 The declining number of students and emptying out of parts of the countryside have created a struggle for existence for these rural schools, which cherish every child, while supporting life in the ever quieter parts of Latvia. Yet, they often miss the main goal, to provide children with a good education. Underlining the rural schools’ special mission in keeping the countryside, Latvia has pretended to be blind to the fact that, increasingly, schools are in the process of splitting students between rich and poor. In nine years, segregation has progressed so rapidly that children of the financially most comfortable and educated part of society are no longer found in almost half of Latvia’s schools. Latvia is significantly ahead of the other states in the Baltic Sea region in segregation of students by home and family conditions, according to Andrejs Geske, the director of the Institute of Educational Research at the University of Latvia. His team is reponsible for conducting the famous PISA tests in Latvian schools. Every third year, almost 6,900 students in 270 schools, aged 15, are surveyed not only about their knowledge and skills, but also about their family conditions (socio-economical state or SES). Does the family have a personal computer? What education do their parents have? Have they read books to their children? The results enable researchers to divide children, anonymously, into ten SES levels: from the lowest to the highest. In 2003, there was at least one child belonging to the highest level – or the more prosperous and better educated strata of families – attending 75% of Latvia’s schools. In 2012, the same indicator had fallen to 55%. The least prosperous pupils are concentrated in schools in the country side. The gap in prosperity between children from the city and country is one of the largest in Europe and continues to widen. The Sala School is in the Smelteri village, on the periphery of the Sauna rural authority. In the autumn and spring, it takes at least half an hour on rough roads to reach it from Preiļi, rattling in your seat, instead of the usual 15 minutes, because of the damage done to unpaved rural roads by the seasonal waters. The Smelteri locals still cling to the hope to see them asphalted one day. The newer of both one-storey structures is assigned to the primary school and kindergarten groups. It has a kitchen, a library, as well as rooms for children spending the night in the school. The second building hosts students from the upper grades. Old windows have been replaced, one building has received a new roof. A present, from one of the teachers, Silvia, 50 black-current bushes, have been planted last year all over the school’s expansive apple-tree garden. A great part of the work has been done by the ‘family’ of the school, and the outdoor fireplace and basketball court, as well as the playground, furniture and computers – on account of a diversity of project funding. Next, central heating is in plans for the older one of these buildings, to spare the school the effort of burning wood in numerous stoves which heats the small house. A small church is found on the other side of the road, encircled by well-bread cattle grazing and tramping the mud closely around it. There are 17 land-farming families living in its vicinity. There is no community house in this village; therefore, the school doubles as the host of community events like the celebrations of the Midsummer light vigils, christenings, and round-number anniversaries. Like in other neighbourhoods, except the capital and the prosperous Outer Riga, the number of students is falling. Though, having remained unchanged at 46, this year can be called an exception in these statistics. Another 20 pupils are in the kindergarten. About a third of them are boarders, arriving in school on Monday morning and leaving Friday night. The over-night stays were introduced in 2009, when headmaster Valentīna Liniņa had started considering such an arrangement as she observed one of the mothers bringing her three-year-old daughter to her kindergarten group every day. ‘Eight kilometres, her bicycle all covered in frost in winter. The school bus was not running yet at that time. Now, there is a bus, but the number of children staying the night in Smelteri during the week only grows every year. The school lacks space to house more. Latvia’s education system does not register the number of children coming from socially disadvantaged families. But Sala is small and the personal story of every child is well known. Iveta’s family found themselves in a rural school, pressed by the circumstances. She decided in favour of transferring them to Sala School after consulting its headmaster. Valentīna Liniņa, who is also chair of Preiļi division of Children’s Foundation, organized summer camps for children from large and economically stressed families as well as children with disabilities. 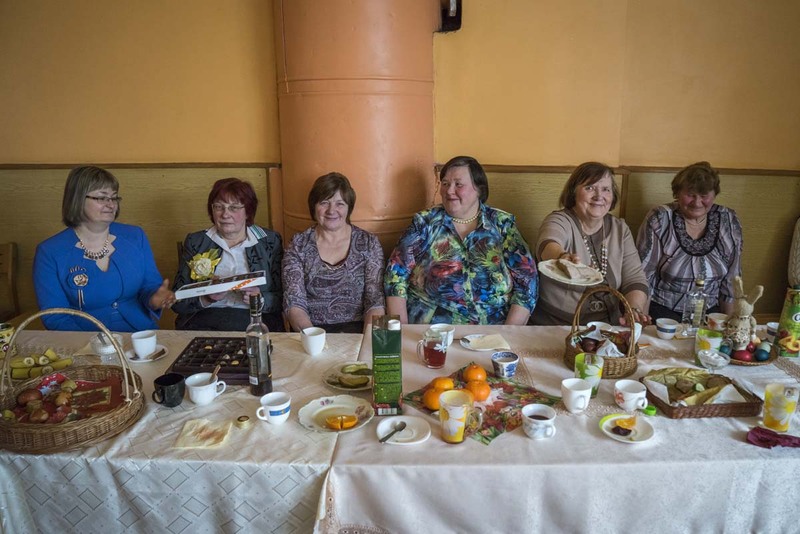 Having divorced recently, a single mother of five, one of whom was a new-born, Iveta struggled to survive in her narrow living space of an old wooden house with a staircase. There was constant shortage of money. And the burden of survival was also heavy physically. Iveta remembers how strange it had felt when her little ones had told her they wanted to go back home one Sunday after she had agreed to their permanent stay in Smelteri. ‘First, I thought they had blurted out a mistake. But, no, they had called their school home for a fact. It felt strange.’ Her older daughters had taken longer and struggled more to get used to it. Now, however, both, Līga and Lāsma who finished Sala School last year and attend the Preiļi Gymnasium for a second year now, have only kind words to say about Smelteri. They recall the way they used to go sliding down their small, self-made ice hill together with teachers on winter evenings, after the fall of night, and their times of playing football, the whole lot of them. Her girls have become more daring in the country, their mother says. 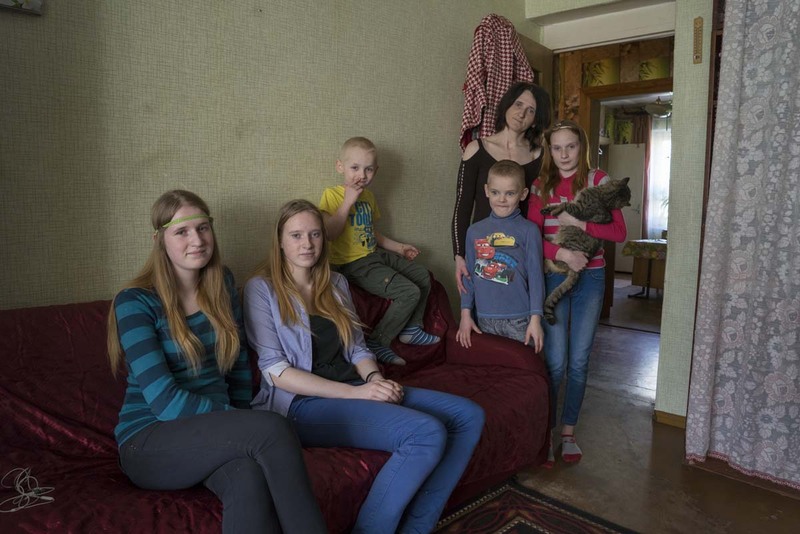 For Iveta, having her children moved to Smelteri one day had been a sizeable blow, which had made her brace herself. When the charity ‘Eurika’ asked her what would be the best way to help her family, Iveta had mentioned her interest to study. After she finishes her correspondence course in Rēzekne Higher School, she will be a certified accountant. A Norwegian family, whom she does not know, covers tuition for her. Iveta plans to practice on her brother’s farm before she would try to find a position in town. The café, which had employed her behind the counter, has long since closed. After battling cancer, she is unable to take physically demanding jobs, and there has not been much luck in finding any others. Iveta keeps repeating that it is much better now than it had been before. As a former cancer patient, she is receiving a disability pension, and her child-care benefits have been increased. Above all, now, they live in a fine two-room social housing apartment on the outskirts of town. If she had not given her children over to Smelteri, she wouldn’t have been able to attend her high school; and could have a chance for a better future. Iveta’s story exemplifies another aspect that contributes to greater social division. It is not only children from rural communities who end up in small country schools. Last year, all three small schools of the region had 15 students from the town of Preiļi and its closest surroundings. A few from the villages – and not from the most underprivileged families – were driven by their parents in the opposite direction. Every fifth child is an arrival from somewhere else in the Sala School, and all of them – due to necessity or learning difficulties. Last year, seven Roma children were taking the road to arrive to this school from their part of the district on the other side of Preiļi. They only learned to speak Latvian in Smelteri. As a rule, they have to work hard to learn their subjects, but excel as singers. The school was packed full last spring for the concert of Roma children it organized. One fifth of the children in this school are taught in special education programs. There are youngsters in Sala School whose parents have lost their parental rights and there are those who are keen to stay in the boarding school even for weekends. ‘We would be fortunate in fact to have a school like Sala. Children failing to manage their lives, those who experience problems regularly, perhaps, they really suffer from the shortage of personal attention,’ headmaster of the biggest regional school, Preiļi 1st Elementary School, Nora Šņepste reflects. Asked why the problematic children would fail to receive such attention in the town school, the headmaster mentions an insufficient number of supporting staff and offers Finland as a guiding example. Finland’s education system is among the best in the world and cites giving the opportunity to every child in every school, irrespective of their family situation, as a key to success. It is ensured by a sufficient number of social pedagogues and a system of identifying the need and correct form of help, offered to every child. The chair of the Preiļi Regional council Maruta Plivda agrees that rural schools with their boarding options are part of the municipality’s social policy. A few years ago, one more of the three regional rural schools opened, in the Pelēči administrative district. Plivda is quick to speak very highly of their rural schools. Parents are content, the state examination results are good, and many of the graduates choose to continue their studies in the Preiļi town gymnasium. However, experts advise not to rely on the results of exams along, for now they are the only single quality measurement, which exists to be used for the assessment of Latvia’s schools. If only for the reason that the test results for grade 9 are corrected by local teachers themselves, and slight improving of numbers in the name of the survival of school cannot be fully discounted. The experts’ concerns are confirmed by the data of PISA – the world’s most widely recognized method for comparing systems of education. Arriving to its top is equal to earning an Olympic gold. The winners are described in bestsellers and education policy makers flocks in crowds of professional pilgrims in search of the best recipe for schooling. Traditionally, China, Singapore, Korea and Finland top the charts in this category, although Finland had fallen slightly in the latest cycle. Among our neighbouring countries, a significant rise has been marked by Estonia and Poland. The academic achievements of Latvian students are on the average OECD level – not especially good, while not bad either. Moreover, they have been improving slightly by each time they are measured. And yet, in a closer look, a less than attractive picture emerges. The results of the Riga Gymnasiums can compare to the leading countries, while, in the rural environments (PISA definition for a rural school is one in a territory with less than 3,000 inhabitants), where families are much less privileged, children’s knowledge is poor. A sizeable gap between rural and urban kids was noticed already in the first survey of the 2,000s and it keeps growing. It means that, recognized in the world as the most direct route of escape from poverty, education fails to fulfill this objective in Latvia. Poverty is the first answer to the question of what has been causing this split. A number of surveys confirm that in very low income families high level of stress prevails and children suffer from neglect, which lowers their self-esteem. They receive worse nourishment as well as, frequently, health care. The consequences of which can be observed in the school. However, methodology employed by PISA, which enables analysis of children’s achievements, indicates another significant aspect. The poorest rural schoolchildren in Latvia lag behind in their studies more than their peers found in a similar situation in several neighbouring countries. In Latvia, the combination of underprivileged family and rural school signifies poor study results and much more often worse future prospects. The fact that there are problems with the quality of rural schools in Latvia was proved by the education researcher Ieva Johansone in her doctoral thesis, produced in University of Latvia already in 2009. 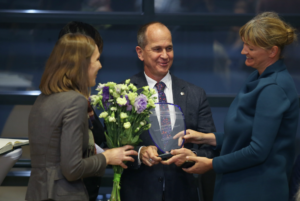 Johansone – who has been working in the highly respected international centre of education research PRLS and TIMSS in Boston for several years – compared the performance of rural and urban schoolchildren in Latvia. Her conclusion was biting. Even the off-spring of well-to-do families, irrespective of high self-assessment, demonstrate worse results than their peers who enjoy a relatively similar level of economic security in the city. In turn, the poorest schoolchildren in rural areas lag behind in achievement even more than their underprivileged peers in towns. Therefore, the blame should be sought elsewhere, not only in the level of children’s living arrangements. Higher Salaries = Better Teachers? The minister of education Mārīte Seile agrees. Calling underachievement of rural schools very alarming, she points indirectly to the quality of teachers and sees a solution in the new system of wages. It’s chances of being enacted seems hopeless at the moment. If work in the smaller schools would be better paid, it would be easier to attract young, more highly motivated and skilful teachers. The declining numbers of students is precisely the reason why the greatest number of teachers receiving the lowest rate (420 euros before tax) is found in the countryside. Many get even less than that because the shortage of kids mean fewer hours. The Ministry of Education (MoE) hopes to raise the minimum payment rate in the group of smaller schools to 760 euros per month. Then, the difference in wages between teachers working in smallest and largest schools would be only 20 % instead of the current 60%. In the Sala School, teachers do not complain about wages. Since several of them are staff of the boarding school, the average income earned here is 633 euros pre-tax. At the same time, Sala experiences a lack of particular specialists just as elsewhere in the countryside where the small numbers of classes fail to ensure even half of the teaching rate. When the English teacher fell ill for a longer stretch of time, it was impossible to find a replacement. The school has been looking for a physics teacher for a long period of time. Now, this subject is taught once a week by the headmaster of the neighbouring Rudzāti Secondary School, and there are times when children travel there by bus for their lessons. It gives them a chance to mix the substances and experiment all day because new natural science classes are found only in secondary schools. In spring, Seile had been hopeful that they would succeed in raising teachers’ salaries this academic year. 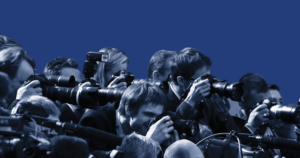 But the reform, which would require an additional 30 million euros, has not even reached the level of government meeting. Larger schools oppose the move, since some salaries would fall for part of their staff. Fearing a possible closing of schools, the municipalities remain apprehensive. Failing to see extra money in the tight budget, the Ministry of Finance has joined those opposing. The salaries of teachers in Latvia, which belong to the lowest within the number of countries assessed by the OECD, wreaks havoc on the prestige of the profession. The younger teachers are reluctant to join the work-force and the existing ones are often unmotivated. The number of surveys confirms that a good teacher ‘elevates’ the schoolchild, but researcher Ieva Johansone warns that it could prove impossible to even out the knowledge gap between the countryside and the urban branches of education. Johansone confirmed the findings made more than 50 years ago by James Coleman, a U.S. education sociologist – that children of poorer families are more sensitive to classmates’ influence and demonstrate weaker learning results when most of their peers are equally underprivileged – can be applied to Latvia’s education system. And if the majority of students in a class come from more comfortable families and enjoy higher support from their parents, the poorer pupil also demonstrates ‘a natural increase in interest and desire to achieve more,’ Johansone explains. Analysing students’ achievements specifically within classes, she concluded that the required majority is six out of ten. If at least that number of pupils came from the medium or high SES index families, the underprivileged rural schoolchild, well prepared for the school at pre-school age, would be safe from dropping behind the average level of the class. Coleman’s conclusions were significant for thinking about ways of reducing the segregation of schools in the US. In order to raise the level of achievements of the poorest children, this scientist advised to ‘inter-mix’ them with their more privileged peers. For Latvia, it would mean that they would have to commute from rural localities with particularly low numbers of children and large proportions of underprivileged to the schools in town, Johansone says. The chairman of PISA research in Latvia, professor Andris Kangro stresses that the smaller schools are not all alike. The weaker ones should be closed, but they must be meticulously assessed before. There is no such assessment in Latvia. Nobody reviews the number of underprivileged children, school attendence, or how many never finish or are expelled. There is no analysis of parents’ opinions or what they accomplish after graduation. The possible variation in the quality of teachers also remains an assumption. Comprehensive measurements of quality would not only help to close the weakest rural schools, but strengthen the rest with additional funding for school equipment and teaching staff, Kangro admits. It would provide a chance also for schools like we found in Sala. Teh Ministry of Education has promised to produce these studies within a couple of years. Research on small rural school network in Latvia. Baltic Institute of Social Sciences. Data form 2012./2013. To view the image fullsize – click on it. In the Netherlands and the Flemish part of Belgium, schools with larger numbers of children from socially problematic families get higher funding. In Estonia, teachers working in remote rural areas are paid additional fees. 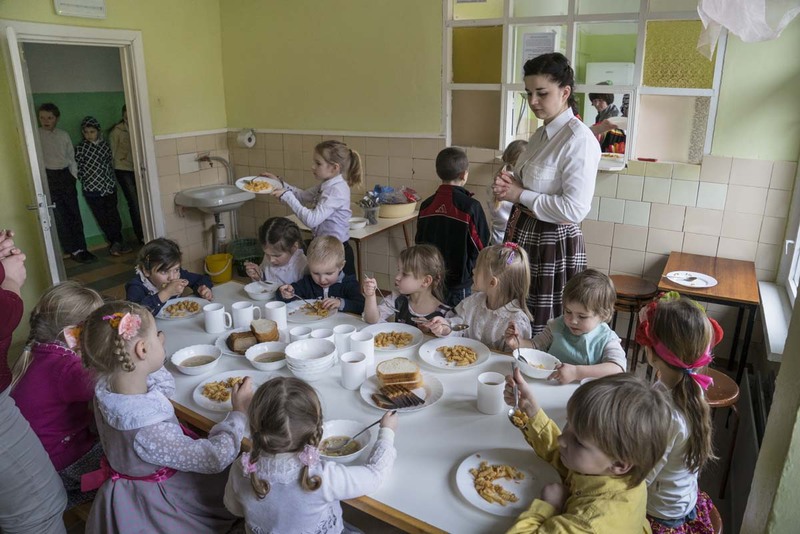 In Latvia, the question whether or not a child is going to receive any help is decided by the size and financial capacities of the school rather than by his necessities. In the last academic year, one third of the schools were short of speech therapists and approximately half of schools – lacked social pedagogues and psychologists. In the Sala School, where there are many children with special needs, a psychologist is available for four hours a month. A Therapist, based in Preiļi 1st Elementary School, arrives to Smelteri only once every month. The speech therapist has concluded that commuting is unprofitable. The school transports children to the therapist, picking up packages of EU-financed ‘school milk’ on the way, which would otherwise remain undelivered. MoE plans to increase the financing for these specialists, but it still remains to be divided by the municipalities. The ministry cites a plan to restrict teachers to working in a single school as another way to support the most underprivileged. That would eliminate the situation where a teacher has no idea what happens to students after leaving the school for several days a week. The costs were the reason for closing rural schools in equally scarcely inhabited Estonia and Finland. The Finns started to reduce them during the economic crises in the beginning of 1990s and have steadily proceeded to this day. More than 1,400 or almost 70% of small rural schools have been shut. Since 2006, the government has discontinued additional funding for the remaining ones. However, there is still a substantial number of them – 660 or almost one in four. In Estonia, the government acknowledged that their network of schools was ineffective already a decade ago. The decisions have been left to the municipalities, but the state has found leverage with a preconditions put down for financing of high schools. The process has not been east in any of these countries. Outi Auti un Eeva Kaisa Hyry-Beihammer, researchers with Finland’s Oulu University, have concluded that lack of the discussions and abrupt decisions have dealt painful blows to local communities. The locals complain of having less reasons to congregate, the environment becomes less attractive to live in, and that does not sit well with intentions to keep the countryside inhabited. Similar reasons for their averseness have been quoted by heads of municipalities, according to a study commissioned by the Estonian MoE. Centre for Policy Studies ‘Praxis’ concluded that no less than 27% or 132 schools would have to be closed by 2020, according to demographic indicators and rational size of school, namely, no less than 45 students. Unlike in Latvia, in Estonia and Finland the achievements of rural schoolchildren are as high as those of their urban counterparts. In Latvia, where the countryside falls significantly behind and which suffers a shortage of teachers because of low wages, almost nothing is done. The responsibilities have been left to municipalities which have acted according to their level of understanding of education. Most often, it has been done to pander to the electorate and with the view of not letting pupils move to the neighbouring municipality along with the money tied to him. In 2009, the crisis did what that government was supposed to do years before. With the state budget collapsing, the government funding of pedagogues’ fees was reduced As a result, the municipalities were forced to close 57 schools – the largest number in a single year. 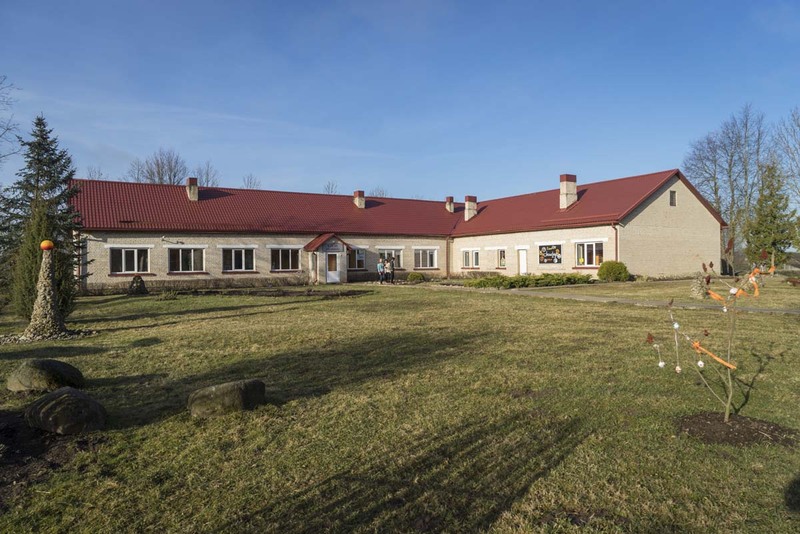 In 2010, the Preiļi city council closed one of its four rural schools, in Aizkalne, better known to many as Jasmuiža, the home of the famous poet and writer Rainis. Today, there are no regrets, and parents are content sending their children to new schools. At the end, the school had 30 pupils. After closure most went to Preiļi 1st Elementary School. Four new children from Aizkalne joined the class tutored by Līga Tumašova and still continue to be part of the school. She is a psychologist in the 1st Elementary as well as two more rural schools and rejects what would be said, later, by the council chairwoman, that ‘a child from countryside gets lost in town.’ ‘If a child is forthcoming, emotionally secure, if everything is all-right with him, there are no problems. If there is something wrong in his family, the children coming from towns do not have it easy at school either. According to the children – now having to commute to the town – the biggest drawback is to wait for the bus after lessons. Most of Aizkalne’s children took their bus rides to school even before it was closed – there are not many houses in the centre of the village, locals mostly live in their distant farmsteads. Now, there are three school buses roaring away into different directions in the morning. Although one of the arguments against reduction of schools has been the distanance between neighbouring ones, the closest, Rušona Elementary school, was picked by the smallest number of families since it is in another administrative region. Competing between themselves for money, municipalities pander to families, at the same time, prompting the locals to doubt that there is much economy in running three buses around. Very often the argument against the closure of the school is the crumbling of the building, and not the quality of education. In Aizkalne, the former school hosts a well-attended community centre. The most questionable step has been the closure of a pre-school group, which the municipality initially wanted to keep, but then decided it’s too costly and the numbers of children was too small. It would be expensive to organize teaching and to retain the canteen. Now, one part of the little ones takes school buses, others stay at home. Based on the results of literacy tests, Johansone revealed in her doctoral thesis that attending kindergarten in rural areas influences a child’s future learning abilities more significantly than in town. Nobel Prize winning economist James Heckman proved in the U.S. that the result of allowing the children from poor families to stay at home would be a failure to prevent their under-achievement in studies later. The simple act of reading aloud to young children significantly influences their entire life. 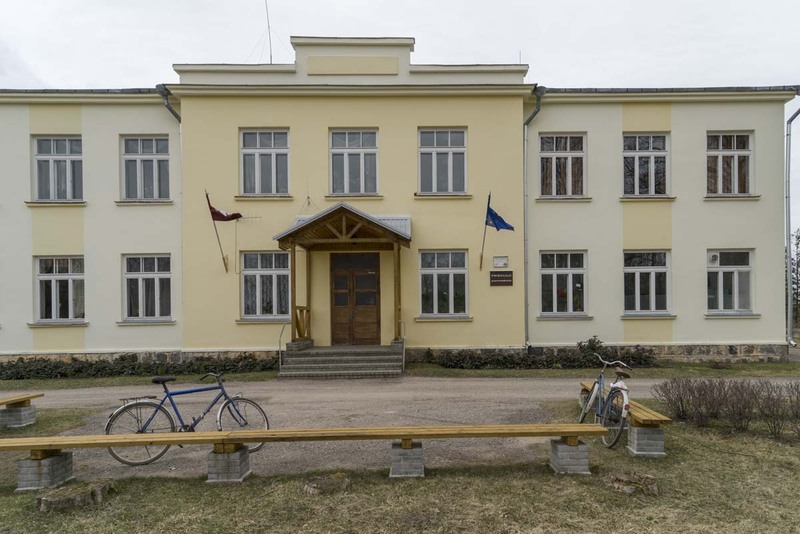 Having closed the Aizkalne school five years ago, the Preiļi regional municipal council had to decide what to do with the remaining three schools. The Priekuļi Elementary school had only 24 pupils left, in grades 1 through 9, and seven more in the pre-school. It’s a 12 kilometres’ distance of asphalted road till nearest town. Locals laugh: it is like a private school, as there are classes listing no more than single pupil. But the council was univocal – the school has to stay. ‘It would be easier for us if the state would enact it from above. We are waiting. I think there are quite a lot of municipalities who are waiting,’ Plivde adds openly, in the end. Iveta’s daughter Līga was also among those who had to reflect on their future this summer. Although her teachers and mother were convinced that Līga should follow her sister Lāsma and apply for the Gymnasium, after a long period of indecision, Līga sought admission in Preiļi Vocational School together with a friend of hers, where she would study to become a chef. The girl who gained self-confidence in communication with peers and joy to be on the stage in the small Sala School, was afraid to fall behind in her studies compared to others. One could guess that she would have had a less difficult choice to make had she been able to take her former friendly environment and her teachers who ‘are always there to help’ and ‘find time for everyone to get close and ask whether they had understood the material’ with her to her new school.